Traditional local bars – they’re all about dingy surroundings, fizzy beer and grumpy staff, aren’t they? Emphatically no, when it comes to Eaglesham’s Swan Inn, affirm East Renfewshire Conservative politicians Paul Masterton MP and Jackson Carlaw MSP. They dropped by during one of the fleetingly sunny spells earlier this week to find this venerable local licensed institution positively thriving. And that’s at a time when pubs across the country are shutting up shop under the pressure of restrictive legislation, cheap supermarket drink and mushrooming alternative entertainment concepts. So what’s the secret behind the apparent success of a bar which some had suggested, until fairly recently, had seen better days? The Swan first opened its doors in 1832 – which the Conservative duo will recall was the year of the Great Reform Act – yet is certainly no museum piece. Leading Scottish licensed trade publication The Dram may supply the answer, as back in February it published an enthusiastic article explaining in detail the amount of effort lavished on the pub since its takeover by new management. Practically everything was treated to refurbishment tlc, not least the kitchen. With that investment have come a new chef, a new menu, and an approach designed to chime merrily with the tastes of what has evidently become a very satisfied local clientele. 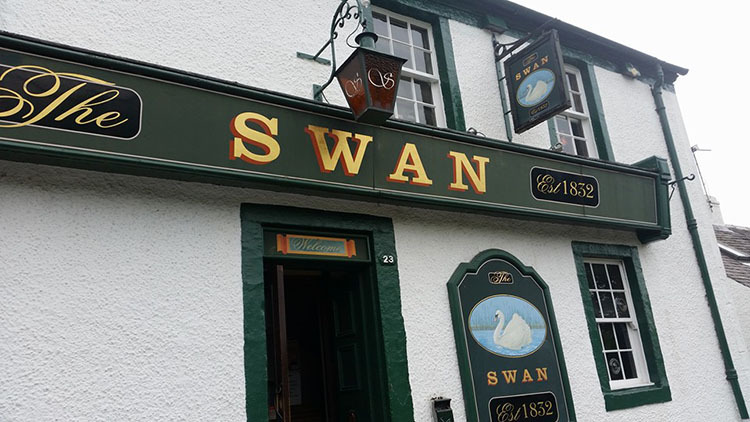 According to Dram editor Susan Young the inspiration hasn’t all been one way, because Eaglesham folk – keen to see the Swan keep going from strength to strength – have been helping out with local produce for the kitchen. Quiz nights with imaginative collectable prizes, competitions, imaginative drinks choices, “excellent” cuisine and reasonable prices are reckoned among the strong points of a bar which can not possibly be described – says Susan – as an ugly duckling. The only possible down side, as Jackson relates – although it won’t displease management – is that the place was “packed out” when he and Paul dropped by. If their response is typical the future of the Swan appears bright and likely to win cross-party support. With much of the traditional Scottish bar trade on its knees this contemporary take on a pub which first started trading when Charles Darwin was making scientific waves could be seen as a resounding victory for well-informed consumer choice.